Fifty years have gone by since the inception of the Patton Museum of Cavalry and Armor at Fort Knox, Ky., and it is still an outstanding repository of Patton memorabilia and mounted warfare. General George Smith Patton, Jr.’s boots, pistols, medals, uniforms, helmets, silver stars of a general officer’s rank, and more are all here, as well as the automobile in which he suffered his fatal accident on December 21, 1945. Other indoor and outdoor exhibits focus the viewer’s attention on the U.S. Army Tank Corps in World War I, the mechanized cavalry years between the two world wars, the Armored Force that came into its own during World War II, the Cold War in both Korea and Vietnam, and finally Desert Shield and Desert Storm in the Gulf War of 1990-1991. A part of the museum, the Emert L. “Red” Davis Memorial Library, contains reference materials relating to mechanized cavalry and armored vehicles and equipment, Patton himself, and Ft. Knox, home of the U.S. Army Armor School. Adjacent to the museum is Keyes Armor Memorial Park, which commemorates organizations from the Army recognized as having served in a combat theater. Not only are U.S. vehicles on display, but so too are those from 14 countries. In all, there are 213 vehicles: 33 on exhibit indoors, 57 outside—others being restored or in storage. Many of the vehicles outdoors are in nearby Keyes Park. Here examples of historic armor can be viewed up close. From WWI there are the French Renault FT17, and the British Mark V. From WWII can be seen the U.S. M4 Sherman tank, the USSR’s famous T34, and the German Panzerkampfwagen (armored battle car). 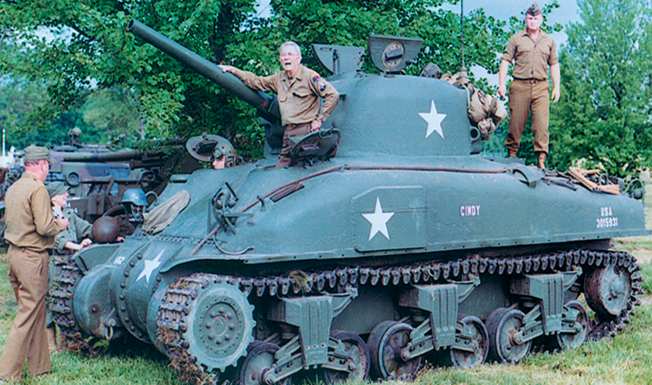 At that time, the Patton Museum Foundation—the facility’s private-sector fundraising arm—began a 5- to 10-year drive to generate $15 million-plus to support a triple-fold expansion of the museum from its current 80,000 square feet to over 200,000 square feet. Said General Sheridan, “The expansion will give the museum the room it sorely needs to properly display the memorabilia and artifacts that trace the exploits of the great armor and cavalry units—divisions, regiments, battalions, and companies—whose World War II associations are beginning to close down their operations due to the passing of their members. In the interactive area, a visitor would be put into the seat of a tank’s driver, gunner, or commander and—through very realistic simulation—fight a tank battle, such as the 2nd Armored Cavalry’s Battle of 73-Easting during Desert Storm or other such battles from World War II, Korea, or Vietnam. Nineteen vehicle types in all can be viewed at the museum: light, medium, heavy, and main battle tanks; half-track, motorcycle, armored car, prime mover, self-propelled artillery tankette, automobile, scout car, personnel carrier, gun motor carriage, recovery vehicle, mortar carrier, armored reconnaissance vehicle, and 105mm recoilless rifle motor carriage. 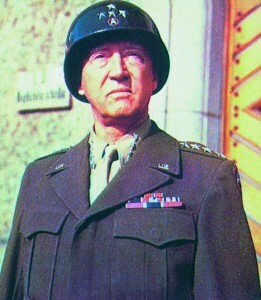 According to one author, Patton “was tough, aggressive, hot-tempered, and, above all, he was impatient. Often referred to as ‘Old Blood and Guts’ by men under his command, he was the best armored force general on the Allied side in World War II.” Hitler admiringly called him “that cowboy general” after the Karl May-written Western novels of his own youth. If Hitler had had Patton in his own stable of generals, the Germans might well have made it to Moscow in 1941, snow or no snow. Patton was born in San Gabriel, Calif, on November 11, 1885. In 1909 he graduated from the U.S. Military Academy at West Point as a cavalry officer, and would forever after wear the trousers and boots of that arm of service. He was considered an expert on both horses (like Ulysses S. Grant before him) and the use of the saber. His portrait has since been painted riding one of the famous white Lippizaner stallions of Vienna’s famed Spanish Riding School. He became an aide to American General John J. “Black Jack” Pershing when the latter was ordered by President Woodrow Wilson in 1916 to capture or kill marauding Mexican bandit Pancho Villa across the border after the latter’s raid on Columbus, NM. One of the museum’s proud possessions is the single-action Colt revolver Patton purchased in March 1916 from the Shelton Payne Arms Company in El Paso. With this weapon—in a celebrated shootout that gained the young lieutenant national newspaper headlines back home—he shot and killed two Mexican bandits and put two notches in the pistol’s grip to commemorate the deed. Arguably his most famous personal symbol, Patton continued to both wear and use this famous revolver until his death in December 1945. A decade before—in October 1935—while on duty with the U.S. Army 25th Division in Hawaii, then-Lt. Col. Patton acquired a .357 Magnum Smith & Wesson pistol with a left-handed S.D. Myers holster. Notes one source, “The only photograph of this pistol being worn or used by Gen. Patton was taken on Nov. 7, 1942 as he struggled ashore from a landing craft in North Africa. The combination of the two holsters on one belt proved to be too much, and Patton had the left-hand holster removed.” This weapon is still considered to be the “second” of the “pair” of Patton pistols, however, and is also a part of the Patton Gallery collection at Ft. Knox. 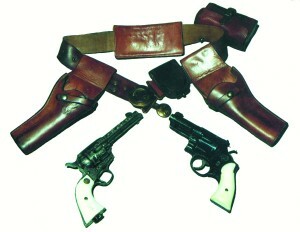 The Colt is a factory-engraved, single-action .45-caliber Army gun, 43/4 inches long, nickel-plated, with ivory grips. Both it and the Smith & Wesson have the initials GSP engraved on their grips. Pershing took Patton with him to France when the country entered World War I. Here Patton served as the commanding officer of the newly formed U.S. Army Tank Corps, and was wounded in action with it under enemy fire in September 1918. The Great War was the last major conflict—other than the Russo-German Eastern Front of World War II—in which the old horse cavalry played a major role; machine guns and barbed wire had effectively ended cavalry usefulness, as Patton himself ruefully noted. He was also quick to note, however, that the mounted warrior of the future would go into combat riding in the new armored tracked vehicle, the tank, as well as the wheeled conveyances of the trucks of motorized infantry divisions. His views were shared by a fellow officer between the wars with whom he served at Camp (later Fort) Meade, Md., Dwight D. Eisenhower, his junior in academy graduation but his senior during World War II. Together they took apart and then reassembled a French Renault tank at Camp Meade to see how it worked. It was at Ft. Meade in 1920 that the Tank Corps was initially disbanded altogether, despite both men writing against the decision in the professional military journals of the day. During the interwar period, Patton held a variety of staff jobs both in the Hawaiian Islands and in Washington, DC, and completed his military schooling as a distinguished graduate of the Army War College at Ft. Leavenworth. Kans. When German Generals Heinz Guderian and Erwin Rommel rolled across a prostrate France in their tanks in 1940, the U.S. Army reestablished its own Armored Force at Ft. Knox, and Patton himself transferred to the 2nd Armored Division at Ft. Benning, Ga., where he was named its commanding general on April 11, 1941. His picture was featured on the cover of Life magazine, and he was depicted as the very epitome of America’s new mounted armored warrior, which he indeed proved himself to be in the years ahead. On November 8, 1942, Patton commanded the Western Task Force that landed with the Allied invasion of North Africa. After the American defeat at the Battle of Kasserine Pass, Ike gave him command of all U.S. forces in the Tunisian Combat Area. That battle won, he commanded the Seventh Army during the invasion of Sicily in July 1943 and its subsequent conquest. In March 1944, Patton was also given command of the new Third Army, which became operational the following August to exploit the Allied breakout from Normandy. It was with the Third Army that Patton achieved his greatest prominence. In October 1945, Patton assumed command of the Fifteenth Army in American-occupied Bavaria in southern Germany. His offensive remarks to the press about the Russians, employment of former Nazis, and criticisms of American politicians led Eisenhower to relieve him of command. On April 30, 1948, General Order #6 at Ft. Knox established the current museum in honor of Patton and the thousands of American GIs who fought in the war. On May 30, 1949, a wartime building in the center of the Armor School on Old Ironsides Avenue was dedicated and the museum became a reality. In May 1999, the museum celebrated its 50th anniversary and launched the current fundraising drive. Said General Sheridan, “The present building was constructed between 1972 and 1992 without cost to the U.S. government by the Patton Museum Foundation, Inc., with funds donated by thousands of individuals and organizations from around the world. 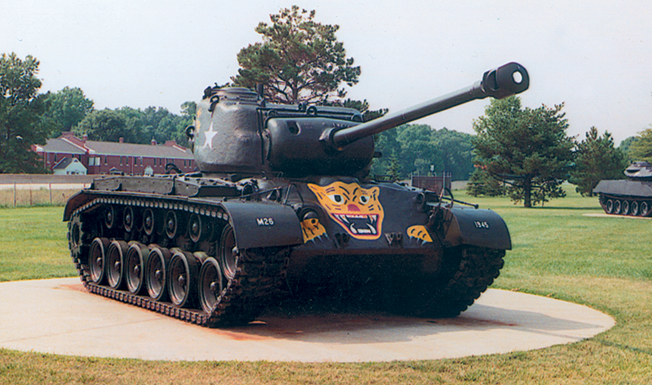 By 1962, the museum had become an integral part of the Armor School and a long-range plan was prepared. By 1992, four additional exhibit wings and the 300-seat Abrams Auditorium were added. Today, the museum includes a gift shop and extensive exhibit halls tracing the history of mounted warfare, as well as the finest public collection of Patton memorabilia (most donated from family members) in the world. There is also the Commander’s Wall near the museum entrance, which is devoted to four portraits, all by artist Jody Harmon, of famed armored warfare leaders during crucial phases of their famed careers: Patton at the 1943 Battle of El Guettar in North Africa; Rommel at the 1942 Siege of Tobruk in Libya; Creighton W. Abrams as commander of the 37th Tank Battalion in the December 1944 relief of Bastogne; and Israeli Army Maj. Gen. Israel Tal as commanding officer of the Steel Division in the 1967 Arab-Israeli Six Day War. More such soldiers of armor will be periodically added.